A group of sailors from a Cornish fishing village are to release an album of sea shanties after catching the ear of a holidaying music mogul. The Fisherman's Friends, from Port Isaac, netted a deal with Universal after being spotted singing in a pub. 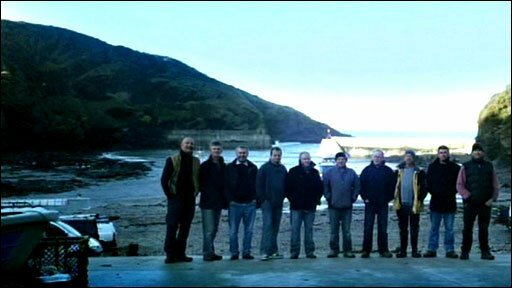 The 10 men, who are or were fishermen, coastguards or lifeboat men, have sung together for more than 15 years. As well as releasing an album next month, they are also due to perform at Glastonbury Festival in the summer. Sea shanties were originally sung by the crews of ships while they worked on deck. The Fisherman's Friends have already released two a cappella CDs themselves and their new album has been recorded in a 15th-century church in St Kew, Cornwall. Jeremy Brown, a fisherman and founding member of the Fisherman's Friends, said: "In Cornish pubs there is a tradition of singing. "We just all got together with the intention of learning all the words instead of just knowing the first verse and the last verse and making up the bit in the middle." Mr Brown, who sings baritone and who has two brothers in the group, said that most of the band had grown up together and the only person who had not lived there as a youngster had been in the village for about 25 years - so was regarded as almost one of them. "We get together each Friday night on this area of concrete by the harbour which is a lovely setting - unless it is raining and blowing and then we just retire to the pub," he added. In 2006 an album of sea shanties was released featuring performances by a host of international singers, including Bono, Nick Cave and Jarvis Cocker.